2016 Drunk History Gallus Mag Episode: "Scoundrels"
2017 Blindspot Devon Penberthy Episode: "In Words, Drown I"
Loss 12–2 Amanda Nunes TKO (punches) UFC 207 02016-12-30-December 30, 2016 1 0:48 Las Vegas, Nevada, United States For the UFC Women's Bantamweight Championship. Loss 12–1 Holly Holm KO (head kick and punches) UFC 193 02015-11-15-November 15, 2015 2 0:59 Melbourne, Australia Lost the UFC Women's Bantamweight Championship. Fight of the Night. Win 12–0 Bethe Correia KO (punch) UFC 190 02015-08-01-August 1, 2015 1 0:34 Rio de Janeiro, Brazil Defended the UFC Women's Bantamweight Championship. Performance of the Night. Win 11–0 Cat Zingano Submission (straight armbar) UFC 184 02015-02-28-February 28, 2015 1 0:14 Los Angeles, California, United States Defended the UFC Women's Bantamweight Championship. Performance of the Night. Win 10–0 Alexis Davis KO (punches) UFC 175 02014-07-05-July 5, 2014 1 0:16 Las Vegas, Nevada, United States Defended the UFC Women's Bantamweight Championship. Performance of the Night. Win 9–0 Sara McMann TKO (knee to the body) UFC 170 02014-02-22-February 22, 2014 1 1:06 Las Vegas, Nevada, United States Defended the UFC Women's Bantamweight Championship. Performance of the Night. Win 8–0 Miesha Tate Submission (armbar) UFC 168 02013-12-28-December 28, 2013 3 0:58 Las Vegas, Nevada, United States Defended the UFC Women's Bantamweight Championship. Submission of the Night. Fight of the Night. Win 7–0 Liz Carmouche Submission (armbar) UFC 157 02013-02-23-February 23, 2013 1 4:49 Anaheim, California, United States Defended the UFC Women's Bantamweight Championship. Win 6–0 Sarah Kaufman Submission (armbar) Strikeforce: Rousey vs. Kaufman 02012-08-18-August 18, 2012 1 0:54 San Diego, California, United States Defended the Strikeforce Women's Bantamweight Championship; Later promoted to UFC Women's Bantamweight Champion. Win 5–0 Miesha Tate Submission (armbar) Strikeforce: Tate vs. Rousey 02012-03-03-March 3, 2012 1 4:27 Columbus, Ohio, United States Bantamweight debut. Won the Strikeforce Women's Bantamweight Championship. Win 2–0 Charmaine Tweet Submission (armbar) HKFC: School of Hard Knocks 12 02011-06-17-June 17, 2011 1 0:49 Calgary, Alberta, Canada Catchweight (150 lbs) bout. ↑ 1.0 1.1 ""Rowdy" Ronda Rousey – Official UFC Fighter Profile". UFC.com. สืบค้นเมื่อ August 2, 2015. ↑ "Fight Card – UFC 175 Weidman vs. Machida". UFC.com. สืบค้นเมื่อ July 11, 2014. ↑ "Ronda Rousey Addresses Women's Equality While Receiving 6th Degree Black Belt In Judo". Yahoo Sports. March 6, 2018. สืบค้นเมื่อ May 7, 2018. ↑ SNL Host Ronda Rousey Lets Beck "The Wreck" Bennett Try His Noggin Lock. January 20, 2016 – โดยทาง YouTube. ↑ Kroll, Justin (September 9, 2015). "Ronda Rousey to Star in 'Road House' Reboot". Variety. ↑ "Ronda Rousey signs with WWE". ESPN. January 28, 2018 – โดยทาง ESPN.com. ↑ Benigno, Anthony. "Kurt Angle & Ronda Rousey def. Triple H & Stephanie McMahon". WWE. สืบค้นเมื่อ April 8, 2018. ↑ Powell, Jason. "Powell's WWE Money in the Bank live review: Two MITB ladder matches, AJ Styles vs. Shinsuke Nakamura in a Last Man Standing match for the WWE Championship, Nia Jax vs. Ronda Rousey for the Raw Women's Championship". Pro Wreslting Dot Net. สืบค้นเมื่อ June 17, 2018. ↑ "Ronda Rousey becomes first female inductee into UFC Hall of Fame". ESPN (in อังกฤษ). สืบค้นเมื่อ 2018-07-06. ↑ "HEYDORN'S WWE RAW REPORT 7/16: Alt Perspective coverage of the live show including Extreme Rules fallout, the future of the Universal Championship, and more -". July 16, 2018. ↑ 11.0 11.1 Whitman, Mike (December 28, 2013). "UFC 168 Bonuses: Rousey banks extra $150,000, Browne, Tate earn $75K awards". SherDog. ↑ Myers, Thomas (March 1, 2015). "UFC 184 bonuses: Ronda Rousey, Jake Ellenberger and more bank an extra $50,000 each". MMA Mania. ↑ "UFC 170 Bonuses: Rousey, Thompson, MacDonald, Maia earn $50K awards". Sherdog. February 22, 2014. ↑ C. J. Tuttle (July 5, 2014). "UFC 175 Bonuses: Chris Weidman, Ronda Rousey, Lyoto Machida, Rob Font Bank $50K". Sherdog. ↑ "Ronda Rousey to coach on UFC's 'The Ultimate Fighter'". สืบค้นเมื่อ February 26, 2018. ↑ "Holly Holm Motivated to Steal Ronda Rousey's Historical Thunder at UFC 193 - MMAWeekly.com". www.mmaweekly.com. สืบค้นเมื่อ February 26, 2018. ↑ CNN, By Jill Martin,. "Rousey wins first UFC women's match - CNN". สืบค้นเมื่อ February 26, 2018. ↑ 18.0 18.1 "By The Numbers - Fastest Finishes in Title Fights". สืบค้นเมื่อ February 26, 2018. ↑ 19.0 19.1 Bohn, Mike (August 2, 2015). "UFC 190 post-fight facts: Ronda Rousey into uncharted territory – in just six UFC fights". MMAjunkie. ↑ "By the Numbers - History of the Women's Bantamweight Division". สืบค้นเมื่อ February 26, 2018. ↑ 21.0 21.1 "10 Olympians who have competed in the UFC". November 11, 2017. สืบค้นเมื่อ February 26, 2018. ↑ Bohn, Mike (February 23, 2015). "UFC 170 post-fight facts: Rousey makes history with 56-day title turnaround". MMAjunkie. ↑ Cox, Lauren (July 15, 2015). "Ronda Rousey Scores Big With Best Female Athlete Win At 2015 ESPYS". Hollywood Life. ↑ "Ronda Rousey zings Floyd Mayweather after taking Best Fighter ESPY". ESPN. July 16, 2015. ↑ Bohn, Mike (March 4, 2015). "MMAjunkie's 'Submission of the Month' for February: C'mon – Like you don't kno". MMAjunkie. ↑ Marrocco, Steven (2015-08-31). "MMAjunkie's 'Knockout of the Month' for August: Armbar specialist has some power". MMAjunkie. สืบค้นเมื่อ 2015-10-06. ↑ 27.0 27.1 27.2 Meltzer, Dave (January 26, 2015). "Jan. 26, 2015 Wrestling Observer Newsletter: 2014 awards issue w/ results & Dave's commentary, Conor McGregor, and much more". Wrestling Observer Newsletter. Campbell, California: 2–5. ISSN 1083-9593. ↑ 28.0 28.1 Meltzer, Dave (January 25, 2016). "January 25, 2016 Wrestling Observer Newsletter: 2015 Observer Awards Issue". Wrestling Observer Newsletter. Campbell, California: 4, 8. ISSN 1083-9593. ↑ Silverstein, Adam (December 26, 2018). "The Man comes around: Becky Lynch breaks out for WWE as the 2018 Wrestler of the Year". CBS Sports. 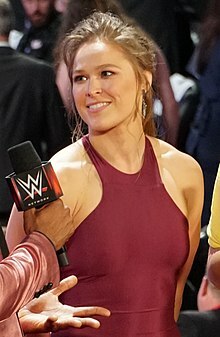 ↑ "PWI escoge a Ronda Rousey como la mejor luchadora del año 2018". cagematch.net. สืบค้นเมื่อ September 28, 2018. ↑ Jeremy Thomas (December 23, 2018). "WWE Announces Year-End Awards on Instagram". 411Mania. สืบค้นเมื่อ December 23, 2018. ↑ WWE.com Staff (March 3, 2018). "Ronda Rousey inducted into the International Sports Hall of Fame at the 2018 Arnold Sports Festival USA". WWE. สืบค้นเมื่อ March 4, 2018. "Ronda Rousey". Olympics at Sports-Reference.com. Sports Reference LLC. Ohlenkamp, Neil; Wilson, Jerrod (2006). "Ronda Rousey – Judo Champion". Judo Info. Archived from the original on May 13, 2010. หน้านี้แก้ไขล่าสุดเมื่อวันที่ 5 เมษายน 2562 เวลา 13:40 น.